Newry Mourne and Down District Council has decided following a debated motion on Monday evening at a full council meeting that it will not apply for borough status. The motion failed to carry a required two thirds majority, and fell on 20 voting for and 16 against. Basically, borough status, which is approved by Her Majesty the Queen, confers the right to appoint a mayor and deputy mayor, use the status of borough, and allows for a certain amount of ceremonial activity such as wearing robes. Councillor Henry Reilly proposed that the council move to borough status, however, a strong contest from Sinn Féin supported by the group of five independents meant the proposal would not succeed. The council debate touched on the perceived role of ‘chairmen’ and ‘mayor’. 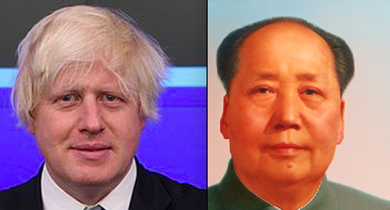 Down News has put two heads together from the political spectrum to show Boris Johnston as Mayor of London who does not appear to engage in ceremonial dressing up, and Mao Tze Tung who has tainted the American conception of ‘chairman’. Councillor William Walker responded t0 Cllr Harty’s ‘no acion’ proposal and said: “I am disappointed that I have heard Terry Harty mention County Louth on a number of occasions. Basically, this motion is about our Council in our county and we have to see it like this. We need to move forward. It appears that this decision to request borough status would require royal assent and that is what Sinn Féin are really sticking with. Cllr Patrick Brown said after the debate: “I voted against the decision to apply for Borough status as I do not feel it has any relevance or benefit to a modern, progressive council. The status would not have meant robing Aldermen, but I still do not see the merit of elevating one of our councillors to the rank of Mayor, either for symbolic reasons, or equally abstract notions that it will bring economic development to the district. SDLP Group Leader Colin McGrath has said he cannot understand why Sinn Fein would deny the people of Newry, Mourne & Down Council a Mayor. Following last night’s council meeting, Cllr McGrath said, “The civic position of Mayor is internationally recognised, be you in America, Asia, Australia, Europe or Africa. 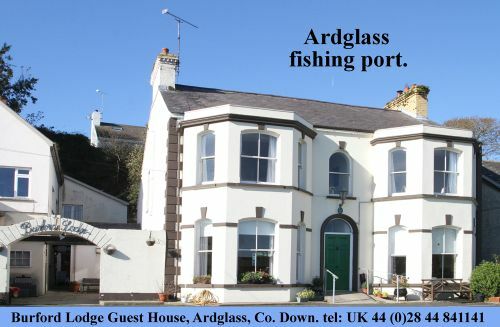 People know what the term means, appreciate that the person is a figurehead for an area and understand that they are approachable on tourism, economic and cultural matters within an area. For Sinn Fein to water this position down to Chairman and prevent the people of Newry, Mourne & Down from having a Mayor is confusing. “There have been extensive discussions in council to iron out the finer details, and broad agreement amongst the bigger parties that we would not incorporate the term ‘borough’ into our title, that we will not appoint Aldermen and we won’t be purchasing any ceremonial robes. The only impact this decision would have is to enable us to legitimately have the position of Mayor. “This also represents a u-turn of sorts as Sinn Fein had no issue last year when the council proposed and seconded and agreed the minutes of the committee which made this decision – with a Sinn Fein councillor proposing and another seconding the minutes. “This is political point scoring at a particularly amateurish level. No one in Newry, Mourne & Down Council area thinks that by adopting ‘borough’ status to provide a Mayor is in any way enhancing their support for the monarchy. At a time when Sinn Fein holds the position of Mayor in Derry, Belfast and Cork it makes this move deeply hypocritical. Cllr Henry Reilly explained that he believed that the proposal would improve the image of the Council. He said: “It is contradictory to oppose the motion. Even Independent Cllr David Hyland agreed to sign a letter to the Queen at an earlier meeting in the Council on this matter. Cllr Hyland (Independent) responded by saying: “It all seems down to one word… mayor. It will really not make a bit of difference. “We should be discussing real issues in this chamber such as the cuts to the A&E service at Daisy Hill Hospital from 8pm to next morning.” The Independent grouping on the Council voted against the motion thus preventing it from reaching a two thirds majority for it to succeed. Cllr Gary Stokes clarified that the Council did not have to use the borough status as a title, nor did it require the councillors to be called aldermen (or women), and it did not have to involve wearing robes. So, the councillors have voted to reject the idea of Newry Mourne and Down Council adopting borough status. But only time will tell if Councillor Michael Carr’s words about making a ‘monumental mistake” will come back to haunt the council.